Comic book fans will soon be getting their first glimpse at an unlikely new superhero — a Muslim boy in a wheelchair with superpowers. 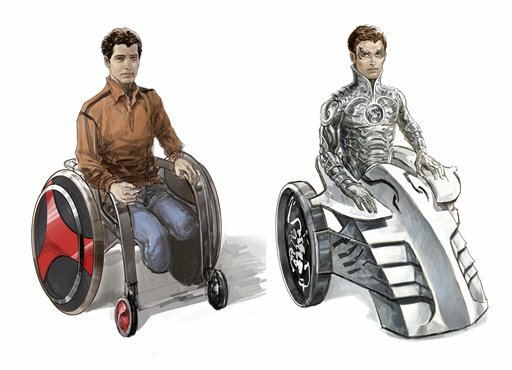 The new superhero is the brainchild of a group of disabled young Americans and Syrians who were brought together last month in Damascus by the Open Hands Initiative, a non-profit organization founded by U.S. philanthropist and businessman Jay T. Snyder. The superhero's appearance hasn't been finalized, but an early sketch shows a Muslim boy who lost his legs in a landmine accident and later becomes the Silver Scorpion after discovering he has the power to control metal with his mind. Sharad Devarajan, co-founder and CEO of Liquid Comics whose company is now turning the young people's ideas into pictures and a story line, said the goal is to release the first comic book — launching the disabled Muslim superhero — in early November in both Arabic and English. Snyder says he was inspired by President Barack Obama's effort to reach out to the Muslim world in his January 2009 inaugural address. Last month, Snyder flew 12 disabled Americans to Damascus to meet their Syrian peers, and one of their main goals was to come up with ideas and story lines for the new superhero. "The only limit was the imagination these kids had — the opportunity for a great story," said Snyder, a comic book collector who heads HBJ Investments LLC. "They helped create something by their combined talents, and that becomes a gift to the world." Devarajan found the young people's imagination to be quite amazing. "The opening question we asked the kids was if you could have any superpower what would it be? I've asked that question in many different groups before and the typical answers are always the ones you'd expect — flying, reading minds, or being super strong," Devarajan said. "The fascinating thing about this group was that I don't think I heard any one of those three," he said. "Each of their ideas was so originally distinct, whether the Syrian kids or the U.S. kids," he said, adding that perhaps because of their disabilities, the young people think as individuals without being influenced by outsiders. One girl, for example, wanted to have the power to combine the energy of the moon and the sun. Devarajan said it was noteworthy that none of the young people wanted the hero's power to be something that cured their disability. "They were empowered by their own disabilities, and they should not be seen as a source of weakness," he said. Initially, 50,000 Arabic-language comics will be distributed throughout Syria, and subsequent issues will be distributed elsewhere in the Middle East, Snyder said. The comic will also be available worldwide for free in digital formats through the Open Hands and Liquid Comics websites. It will be the first in a series of comics with international superheroes, and while one will have disabilities others will not, Devarajan said. He added that almost all the characters being planned "are based on the seeds that were created by these kids together in this trip." The dozen Americans were selected after a national call for applications by The Victor Penada Foundation, a non-profit educational organization that promotes the rights of young people with disabilities. They included youths who were blind, deaf, using wheelchairs, or suffering from Down syndrome, autism, and cognitive disabilities. The Syrians were invited by the Al-Amal school for the disabled whose chair, Asma Assad, the wife of Syrian president Bashar Assad, spent an afternoon meeting with the youngsters. "It must be every child's dream to create a superhero," the Syrian first lady said in a video provided to the AP. "But I really do hope that we can bring our powers together — our human powers together — to be able to make a difference." Hamza Jaka, 18, of Fontana, Wisconsin, who is co-chair of Kids as Self-Advocates which promotes the rights of young disabled people, said the visit to Syria "was great" because it was people-to-people, "not politicians flying in and blustering." Jaka, a freshman at the University of California at Berkeley who is studying linguistics, said the trip has inspired him to study Arabic. "There's a lot of hatred, and it really can be dispelled by just sitting down and talking to people and realizing you share experiences in common," he said. "That's what happened when I started talking to one of the disabled Syrians. We both discovered that we had a love of basketball and ... loved the same players," Kobe Bryant and Shaquille O'Neal. "I am a disabled Muslim and I love comic books, so this is like the highlight of my life," said Jaka, who has cerebral palsy and uses a wheelchair. "As somebody who owns a lot of comics and has studied how they affect social change, it was fun to be part of an exchange that hopefully can do the same," he said, especially in changing attitudes towards the disabled, towards Muslims, and towards Syria. Abdulrahman Hussein, 20, a Syrian student who was born handicapped and uses a wheelchair, said meeting the young Americans "made me feel that I have to improve my life." He said he is studying library administration at a university and wants to learn English so he can have contact with more people. "I like the American people as I found them friendly," Hussein said. "I'd like to visit America because I want to get acquainted with the achievements (of) the Americans." The Open Hands Initiative was launched last November to respond to Obama's offer to the Muslim world in his inaugural address to "extend a hand if you are willing to unclench your fist." Snyder said the initiative's goal is to promote "diplomacy" between ordinary people that emphasizes dialogue, understanding and mutual respect. It has already started a program to bring Syrian music to the U.S. and is planning to bring leading American artists to Damascus for workshops with young Syrian artists. In early 2011, Snyder said Open Hands hopes to be on the ground in Pakistan with programs bringing Americans and Pakistanis together in the fields of public health, literature and culture — and later in the year it intends to launch projects in Afghanistan.